You'll have fun experimenting with these old fashioned meringue recipes. Some cooks view traditional meringue making as a creative hobby or an art form, and they are a joy to make. Practice making a few before your next party. Your guests will love them and marvel that you made them yourself. These special candy recipes from 19th-century chefs will help you to release your creativity. Avoid making meringues on a damp or humid day; they don't take well to any moisture. Add the sugar after the whites have formed soft peaks; add sugar very gradually while continuing to beat the meringue mixture. The meringue mixture is done, and no longer needs beating, when it is firm and no longer running. Make sure the sugar is completely dissolved during beating. Use a knife dipped in cold water to cut baked meringues. Whites 4 eggs, 1/2 teaspoon vanilla, 1-1/4 cups powdered sugar, or 1 cup fine granulated. Beat whites until stiff, add gradually two-thirds of sugar, and continue beating until mixture will hold its shape; fold in remaining sugar, and add flavoring. Shape with a spoon or pastry bag and tube on wet board covered with letter paper. Bake thirty minutes in very slow oven, remove from paper, and put together in pairs, or if intending to fill with whipped cream or ice cream remove soft part with spoon and place meringues in oven to dry. To meringue glacé mixture (above) add chopped nutmeat; almonds, English walnuts, or hickory nuts are preferred. Shape by dropping mixture from tip of spoon in small piles one-half inch apart, or by using pastry bag and tube. Sprinkle with nutmeat and bake. Shape meringue glacé mixture (above) in rounds the size of mushroom caps, using pastry bag and tube; sprinkle with grated chocolate. Shape stems like mushroom stems. Bake, remove from paper, and place caps on stems. Fill meringue glacées (above) with ice cream, or ice cream and water ice. Garnish with whipped cream forced through pastry bag and tube, and candied cherries. These are the actual meringue recipes that were once used commercially by the Parkinsons in their famous bakery. Ten whites of eggs, twelve ounces of sugar. Obtain the newest laid eggs, and separate the white from the yolk very carefully; put the whites into a pan, which must be quite free from grease; whisk them to a very strong froth so as it will support an egg, or even a greater weight; have the sugar pounded and sifted through a lawn sieve (fine sieve), and mix it as lightly as possible. Spread some pieces of board about an inch thick with heavy brown paper, then with a table or dessertspoon drop them on the paper about two inches asunder, dust them with fine powdered loaf sugar, blow off all that does not adhere, and put them into a cool oven to bake until they are a nice light brown; if the oven should be too warm, when the surface gets dry or hardened cover them with paper; as soon as they are done take them off with a knife, press the inside or soft part down with the top or the back of a spoon, place them on sieves, and put them into the stove to dry; when they are required to be served fill them with any kind of preserved fruit or cream, if it is rather acid the better, and put two together. The quality of the meringues will depend on the eggs being well whipped to a very strong froth, and also on the quantity of sugar, for if there is not enough they will eat tough. Twelve ounces of sugar powdered very fine and passed through a silk sieve, the whites of six eggs beaten to a strong froth; mix and lay out on paper, as for dry meringues: when baked, place two together. The size should be about that of a pigeon's egg. To make these, take either of the pastes for meringues or light icing, as for cakes; put some into a bag in the shape of a cone, with a tin pipe at the end, the same as used for Savoy biscuits; lay them off in drops the size you wish them to be, on iron plates rubbed quite clean and dry, bake them as you would meringues, make also a smaller drop to form the stalk; when they are baked, take them off the tin, and scoop out a little with your finger from the bottom near the edge, to form the hollow rough surface underneath; then dry them in the stove; scrape some chocolate and dissolve it in a little warm water, and rub a little over the rough part underneath; then place the stalk in the center, fixing it with a little icing, and let the flat part, which was on the tin, be placed outermost to represent where it was cut. One pound of sugar, the whites of six eggs; clarify the sugar, and boil it to the blow; in the meantime, whip up the whites, as for dry meringues, take the sugar from the fire, and rub it against the sides of the pan to grain it; as soon as it begins to turn white, mix in the whipped eggs, stirring the sugar well from the bottom and sides of the pan, with the whisk; lay them off and bake as dry meringues. These may be colored, by adding the liquid food color to the syrup, so as to give the desired tint; and either of them may be flavored, by rubbing off the peel of oranges, or lemons, on sugar, and scraping it off as it imbibes the oil; or it may be flavored with vanilla bean, by cutting it in small pieces and pounding it with some sugar; or with any liqueur, by adding a spoonful or two, when you mix the eggs, or sugar. They may also be varied in shape. The tops may be covered with almonds, blanched and cut small, or in slices, or with currants, or colored sugars; the whole depending on the taste and ingenuity of the artist. One pound granulated sugar, whites of nine eggs. Whip eggs until dish can be inverted without their falling off, and then simply add the sugar, incorporating it thoroughly, but stirring as little as possible. Prepare boards three-fourths of an inch thick, to fit oven, and cover them with strips of heavy brown paper about two and a half inches wide; on these drop the mixture from the end of a dessertspoon, giving the meringue the form of an egg, and dropping them about two inches apart on the paper, and bake till a light brown. Take up each strip of paper by the two ends, turn it gently on the table, and with a small spoon take out the soft part of each meringue, strew over them some sifted sugar, and return to oven bottom side up to brown. These shells may be kept for weeks. When wanted for table, fill with whipped cream, place two of them together so as to enclose the cream, and serve. To vary their appearance, finely chopped almonds or currants may be strewn over them before the sugar is sprinkled over, and they may be garnished with any bright-colored preserve. You'll love trying these old fashioned meringue recipes. 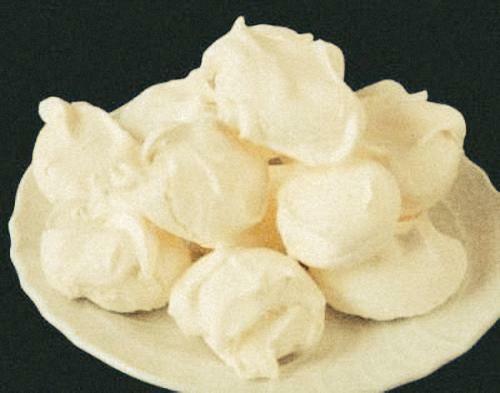 Meringues possess a rich history in the world of confectionery. They are believed to have been first invented by a Swiss pastry cook in the early 1700s. Queen Marie-Antoinette of France (1755-1793) loved to eat meringues in any shape or form, and it's said that she enjoyed making them with her own hands, likely in a manner similar to the methods described below. For an elegant confection to serve on special occasions, you can't beat these light, delicate, melt-in-your-mouth candies.